ReBOSSIS, proudly developed by ORTHOREBIRTH, is an innovative, world’s first cottony type, synthetic bone-void-filling material. Its main ingredients include β-TCP (β-Tricalcium Phosphate that is excellent in bioabsorbable property), PLLa (Poly Lactic Acid), and SiV (Silicone-containing Calcium Carbonate that promotes the bone formation). Being cottony type and using these ingredients are the greatest advantage of ReBOSSIS. ・ReBOSSIS is a synthetic bioresorbable bone void filler for the repair of bone defects with handling characterists of cotton. Consists of beta-tricalcium phosphate (β-TCP), silicon-doped vaterite (a form of calcium carbonate), and a resorbable scaffold of poly-L-lactide (PLLa). ReBOSSIS contains 1% silicon by weight, a level similar to that present in normal growing bone. 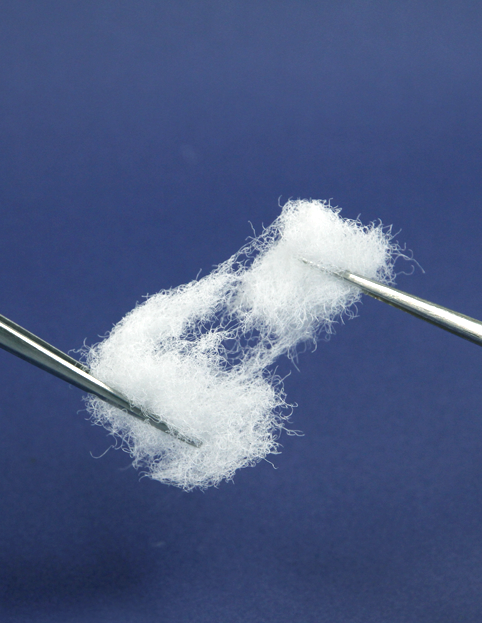 The diameter of the fibers in the PLLa scaffold ranges from 10 μm to 50 μm. The interconnected macro- and microporous structure allows for formation of new bone and the growth of capillary blood vessels throughout the network of interconnecting pores. The product form allows for versatility in handling and ease of use.